When you’re sick, you have symptoms. Your car is no different. While most ailments require the attention of a trained professional to diagnose, like a doctor or mechanic, some are more apparent to everyone. While far less common today than even say 15 years ago, smoke from your car’s exhaust indicates an engine problem. Paying attention to what comes out your vehicle’s tailpipe can help you catch problems before they become more serious and expensive to repair. 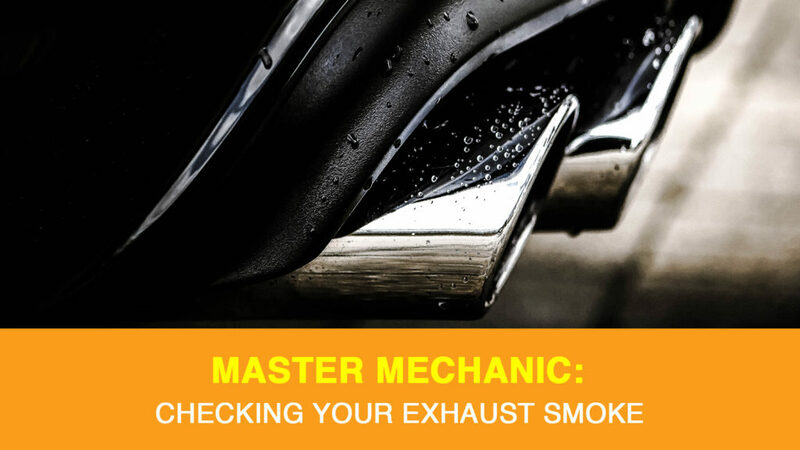 We sat down with a Master Mechanic to see what your exhaust smoke says about your engine health, and what you should do about it. Each vehicle’s engine is specially designed to operate with a specific combination of fuel and air. Black smoke is a telltale sign that your air-fuel mixture is too rich. There are a few different underlying reasons that could cause this. They range from leaking injectors, which introduce too much fuel into your combustion chamber or a problem with the engine management system causing it to supply too much fuel. If you notice your engine isn’t running as smoothly as usual or that you’re burning gasoline more quickly, you may have a faulty sensor on your hands. If you haven’t seen blue smoke coming from a car, it might sound a little strange. Blue or greyish smoke is a sign that your engine is burning oil. It’s no secret your engine relies on a combination of many well-oiled parts to keep your vehicle moving. The engines combustion chamber is not one of them. It should only ever have air, fuel, and a spark present to be work efficiently. When oil gets into your combustion chamber it’s usually due to leaking valve seals, excessive valve stem clearance, or worn piston rings/cylinder walls. Depending on how worn these components are, you may see it coming out your tailpipe. In addition to reduced fuel economy, acceleration, and rougher idling, burning oil means you’re losing oil, which can cause a whole other list of problems, such as shortened spark life and even a plugged catalytic converter. Don’t confuse white smoke with normal white vapour that dissipates quickly. Under colder conditions, it’s normal to see thicker white vapour come from your exhaust due to condensation produced by the gasoline combustion process. However, consistent dense white smoke, though, typically means that coolant is leaking into the combustion chamber. Coolant getting into the combustion chamber is a serious problem that needs to be addressed immediately. If you don’t get this looked at by an expert, like your local Master Mechanic, you run the risk of overheating your engine or causing serious damage to other components such as engine bearings. The cause? It could be as simple as a blown head gasket, which wouldn’t require significant engine overhaul. Other possible culprits may be a damaged cylinder head or cracked engine block, which would, unfortunately, need an engine overhaul or engine replacement. The important thing to remember is if you see thick white smoke that doesn’t go away, stop driving immediately and call your local Master Mechanic. Exhaust smoke colour is never a guaranteed way to diagnose an issue with your engine, but it’s an excellent place to start. As always, if you’re unsure about anything, it’s still best to reach out to your local Master Mechanic. We’re always happy to help!